It’s an exciting scary time of year when all Bloody ‘ell breaks loose on Halloween night! 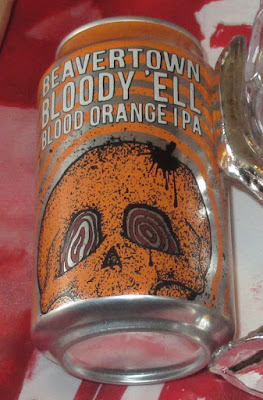 What better than Beavertown’s Bloody ‘ell Blood Orange IPA to wash down all the mayhem? 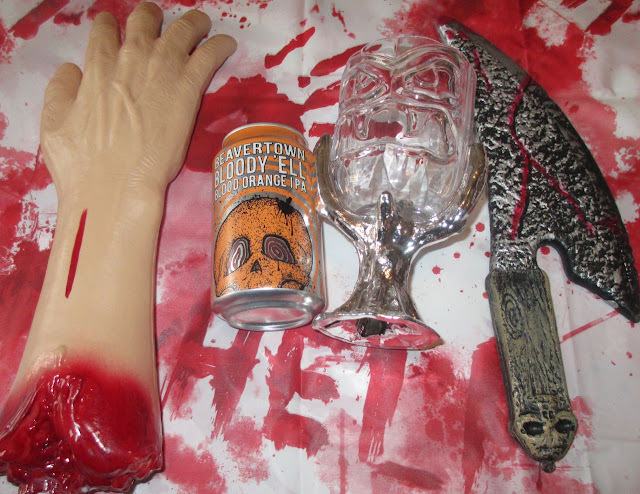 Brewed with blood oranges this beer has a different take than pumpkin beer for Halloween, although it has a hollowed out blood orange skull on the front of the 330ml can that reminded me of a butchered pumpkin. Opening the fridge I felt like some freakish secret Blood Orange beer drinker! The fridge light flicked on, but the can wasn’t there. “It’s behind you!” Cinabar cackled, for some reason dressed in a witch’s outfit pointing with the fuzzy end of her broom. I span around on one heel staring at the can, the can staring back. The fridge light got bored and flicking off. The can attacked! I wrestled it back to the work surface as it fought like the hound from hell.